Loving the pictures, day-dreaming of Barcelona! I first saw this book in a tourist shop at La Rambla i Barcelona, but didn't buy it, which I regretted during the whole trip. When I were at the airport to fly home I saw the book again, in a bookstore and I didn't hesitate to buy it this time! Which I don't regret one bit!This book gives one a really good overview of Antoni Gaudí's life, well at least of what we know about him and his works. 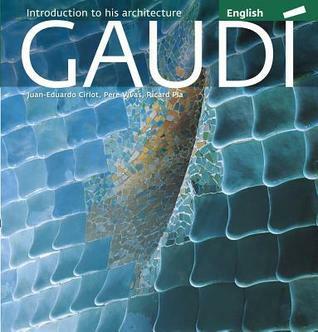 The authors explain Gaudí's view of architecture really well and how different stages in his life coloured his architecture style. When it comes to the pictures, they are wonderful to look at and I like how details in his architecture are taken out and explained more thoroughly.I don't want to think about what I'd have done if I hadn't bought this book, because it's amazing. It opened my eyes to Catalan Modernisme and as I said before, the pictures are amazing! Lindo libro, aunque es más de fotos que de texto. No cuenta demasiado sobre Gaudí. Tiene fotos muy copadas, y a mí me sirvió como introducción a la obra del arquitecto. La verdad que no conocía mucho, y me dejó con ganas de ir a Barcelona a ver los edificios personalmente. Será en el próximo atraso cambiario, o me conformaré con Street View. Todos los edificios de este muchacho tienen un aire muy mágico. Me reavivaron las ganas de vivir en una casa de autor. Compraré el gordo de Navidad, a ver si tengo suerte. Me recordó a Paez Vilaró, pero bien hecho. Cuatro estrellas. Heet in NL "Gaudi inleiding in zijn architectuur"